Last night (Thursday, 2 November) the BBC News at Ten concluded its special series on gun and knife crime with a focus on stop and search and police resources. The programme reported that the number of crimes involving guns or knives is on the rise in parts of England and Wales. They featured interviews with young people who had been subject to stop and search and criticised it, and with a police officer who explained how the power is used. It was reported that the Home Secretary had backed the Metropolitan Police's use of stop and search. The Police Federation told the BBC that the level of violence and threats facing officers is unprecedented and that there were 20,000 fewer officers on the streets now than in 2010. Our response to the BBC's report last night is below. We are clear that all crimes reported to the police should be taken seriously, investigated and, where appropriate, taken through the courts and met with tough sentences. This Government protected overall police funding in real terms since the 2015 Spending Review and maintained that protection in a fair funding deal this year. The independent Crime Survey for England and Wales – acknowledged by the ONS as our best measure of long term crime trends experienced by individuals and families, shows a substantial fall of 9 per cent, in the year ending June 2017 and 38 per cent since June 2010. Further background on police resources and the work we are doing to tackle knife crime is also below. Decisions about the size and composition of a police force, including those in local policing roles, are for Chief Constables and democratically accountable Police and Crime Commissioners. Since 2010, the proportion of officers working at the frontline has increased and is currently at over 93%. By 6 November, the Policing Minister aims to have spoken to every force in the country - as well as many frontline officers – about the demands they face, but also how we can make police forces more efficient. Stable funding means essential reform and transformation of policing can continue. Her Majesty's Inspectorate of Constabulary has said there is considerable scope to improve efficiency. The Government is supporting a range of action to tackle knife crime. Our work to tackle knife crime is centred on four key strands — working with the police on operations and enforcement, work on legislative framework, work with retailers on responsible sales, and early intervention and prevention. 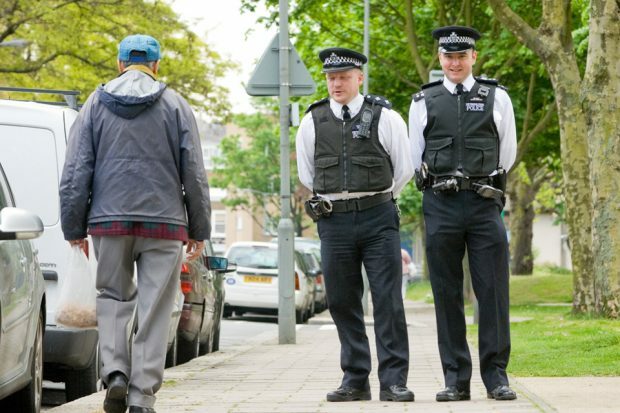 We support police forces to undertake co-ordinated national weeks of action to tackle knife crime through Operation Sceptre — in July a record 32 forces took part making arrests and getting dangerous weapons off the streets. We have already banned zombie knives and we are working with major retailers to stop underage sales of knives. We have launched a £500k community fund to support local communities to tackle knife crime and we are currently considering the bids received. We continue to support voluntary sector organisations to provide interventions in hospital emergency departments to those young people admitted who have been injured with knives. We are also currently consulting on new offences to tackle offensive weapons including knives. This includes new offences to prevent knives sold online being delivered to a home address and ensuring age ID is checked, keeping offensive and dangerous weapons in your home, making it easier to prove the offence of threatening with a knife, and extending the offence of possessing a knife without good reason to include the grounds of colleges and universities.